Burning a CD in Windows XP is a lot easier than most people think. In fact, it has become a lot like copying files to a floppy disk. In this tutorial we will show you how to copy files from your computer’s hard drive to a blank CD-R disk. Before we begin, lets get come terminology out of the way. To write information to CDs, your computer must be equipped with a drive that is capable of doing this. These drives are called CD-RW drives. Most new computers are equipped with them, or with drives that burn DVDs as well as CDs. Once you know you have a CD-RW drive in your computer, next you will need a blank CD to record to. Blank CDs can be purchased in spindles of anywhere from 25 to 100 discs from your local computer store or Wal-Mart. There are two different basic types of discs. CD-Recordable (CD-R) discs are one-time use CDs. You can not erase them or reuse them once they have been written to. CD-Rewritable (CD-RW) discs can be erased and reused. But before you decide to buy a fist full of CD-RW discs, there are some tradeoffs. CD-RW discs are about four times more expensive than CD-R discs. Also, keep in mind that if the CD becomes scratched it is unusable no matter what type it is. CD-RW discs can *technically* be used hundreds of times. However, we have yet to see someone use a CD-RW disc 100 times and not scratch it. Also, CD-RW discs will work fine in your CD-RW drive on your computer, but they will not work in audio CD players (like in your car) or in some older computers. With that out of the way, lets burn some files! Insert your blank CD-R or CD-RW disc into your CD-RW drive. You might see a window similar to the one on the right. Once the “What do you want to do” screen appears, click “open writable CD folder” and the window on the right will appear. This is where some people become confused. On some PC’s the screen on the previous page will not appear on its own when you insert a blank CD. Don’t worry. If the screen did not appear on your PC, then you can get where you need to be manually. Click on Start, and then on My Computer. Now double click on your CD drive (usually the D: or E: drive). Now you should see the window on the right. Now that you have crossed that hurdle, on to the easier part! 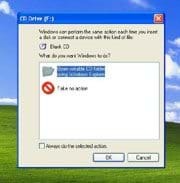 To copy files from your computer to your CD all you have to do is drag the file or folder from any other screen on your computer and drop it in the screen you opened earlier. Once you drop the file or folder there, it will appear in the CD drive window. For example, lets copy your My Documents folder onto a CD. Click on the My Documents folder on your desktop, and drag it into the CD Drive window. See the image on the next page. Once you have dropped your My Documents folder into the CD Drive window, it should look like the picture to the right. Note that you did not erase your My Documents folder. You have simply copied it to the CD Drive window. Depending on your Windows configuration, you may have a link on the left side of the CD Drive screen (as depicted on the right) that says “Write Files to CD.” If you have this link, click on it to continue. If you do not have this link, then click on File (in the top left corner) and then on “Write these files to CD” in the menu. 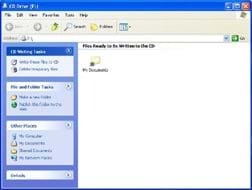 After you have clicked on the “Write these files to CD” link, you will see a screen like the one on the right. This is the CD Writing Wizard screen. This screen is asking you to name your CD. You will notice that there is a text box where you can type a brief name for your CD. Typically, this text box has the current date in it, and you don’t have to change a thing of you don’t want to. Sometimes it is easier to have a CD named “Vacation Pictures” than to have one named June 6, 2006. After you have named your CD, click the Next button in the CD Writing Wizard window to continue. 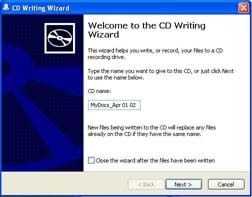 After you have clicked next, the CD Writing Wizard takes over for you. You will notice a progress bar in the window similar to the one depicted on the right. It will measure the progress of your CD burn. Creating a CD can take different amounts of time depending on the speed of your CD-RW drive, or the amount of information you are trying to burn to the CD. As the process continues, you will notice the progress bar move from the left side of the screen to the right, indicating that the burn process is ongoing. You will also see an estimate of the actual time remaining until your CD burn is complete. You don’t have to do anything on this screen, so just sit back, be patient, and watch. Once the progress bar has completed, your CD creation process is finished and you will see a screen like the one on the right. 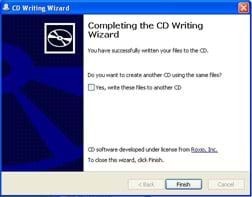 If you see this screen that means your CD was created successfully. There are a few error screens you could also get if the burn process fails (which does happen sometimes), but for now we will assume success. 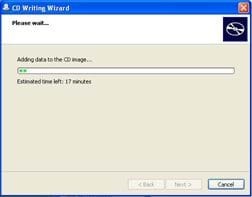 Next, click on the Finish button in the CD Writing Wizard. The wizard will then close, and your CD Drive will eject the finished CD. It is important to note that home made CDs are more sensitive to scratching than the pressed CDs you buy at the store with music and software on them. You need to treat your burnt CDs with care. Also, never use a sharp writing instrument (like a ball point pen) to label your CDs. Permanent markers (like Sharpies) typically work best. If you want a more professional looking label, there are many programs available at your local computer software store to print fancy labels that stick to your CDs. That’s all there is to it. Have fun burning your CDs!